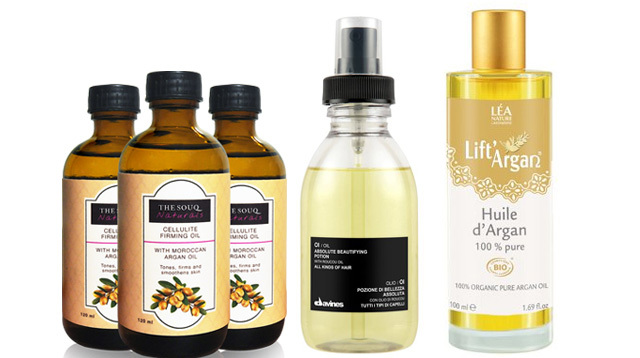 When it comes to using oils, we’re always a little wary. Too much on your hair can lead to greasy dandruff. Too much on your bod can lead to unwanted breakouts. But here’s the good news: When you do find the right oil, it can work wonders for your tresses and complexion—especially now that the cooler weather may be drying out your skin. We did the research and found a few faves that are worthy of being staples in your beauty routine. Check ’em out! Davines Oi Oil Absolute Beautifying Potion, SRP P1,195, available at leading salons. This hair wonder works as a fab detangler and heat protector, and it even helps stimulate melanin production (read: no white hair!). The natural ingredient, roucou oil, is packed with beta-carotene (100 times more than carrots), to help reconstruct your strands, banish frizz, and encourage hair growth. Moroccan oil, available at leading salons. Victoria’s Secret angels Rosie Huntington-Whitely and Cara Delevingne are fans of this product and use it to keep their hair lush, hydrated, and shiny! Need we say more? The Souq Naturals Cellulite Firming Oil with Moroccan Argan, P1,200. Want to help lighten the appearance of dimply thighs? This effective slimming blend is made from natural ingredients and generous amounts of organic, cold pressed, authentic Moroccan Argan Oil. Moringa-O2 Malunggay Herbal Hair, Scalp & Skin Therapy Oil, P99.75, available at drugstores. This potion is packed with three natural anti-oxidants—moringa (malunggay), omega, and olive oil—to provide the skin the nourishment it needs. You can use it from head to toe, but we love using it to moisturize our hands, cuticles, and cracked heels. Lift’Argan Huile d’Argan, P1,450, Rustan’s. It’s 100% pure organic argan oil, so it loads your skin with the essential fatty acids (omega 6 and 9) it needs to fight wrinkles. Apply a light layer over your face and neck to keep your skin supple, glowing, and hydrated sans breakouts. Juice Beauty Stem Cellular Cleansing Oil, P1,800, Beauty Bar. Get rid of skin impurities (and makeup!) with this organic cleansing oil that’s packed with grapeseed, fruit stem cells, and vitamin C to brighten your complexion and fight the signs of aging.